“Older people who do not have help for daily tasks such as dressing and bathing are much more likely to be hospitalized for acute illness than older adults who received the help they need”, according to a Purdue University study that dates back to 2006. 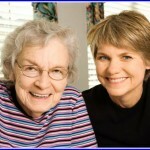 Their study also “found evidence that older adults who qualify for nursing home care because of their disabilities in daily tasks, can continue to live in their homes provided they receive assistance with fundamental needs such as bathing, dressing and preparing food.” Elders who lived alone without such needed assistance were more likely to require hospitalization. After a few weeks of help with daily tasks, however, the need for heath care dropped off, implying that a little help with the basics goes a long way. Nearly 30% of adults age 75 and older have one or more disabilities in performing basic activities of daily living. The Purdue study found that people who have difficulty with Activities of Daily Living (ADL’s) including bathing, dressing, and walking across a room need the health-care system to a greater extent. Those who have trouble with ADL’s have higher rates of hospitalizations, longer hospital stays, and more physician visits that those with no disabilities. Well over $130 billion is spent each year in the United States on long-term medical care, about 73% of which goes to nursing homes. Half of long-term care is paid by the government. Keeping a person in a nursing home costs the government over $30,000 per year, while paying a home care aid to visit for a few hours a day would costs perhaps a third as much. Additionally, they receive the added quality of life that comes from remaining in their familiar home surroundings. Findings of this type are the basis of many of the efforts to reduce the cost of long term care. With the increasing numbers of elderly over the next 2 decades, every effort will be made to provide great service to our seniors at the best price point possible. Home care has proven to be a win-win-win solution.